Many of the traditional herbal teas we consume for flavor or other benefits provide anti-candida effects. Two of my favorite anti-fungal teas are Pau d’Arco and Lemongrass. While there are many effective maintenance teas that are good for in between cleanses, these two herbs are especially powerful anti-fungal agents, best used as part of a targeted cleansing program. In fact, consuming them regularly during your cleanse can cut the length of your program in half! The most efficient and pleasant way to consume Pau d’Arco bark (Tabebuia avellanedae & spp.) and Lemongrass (Cymbopogon citratus & spp. )is as a strong decoction (a water extract made by boiling the herb). A standard infusion will not extract the necessary phytochemicals, and is a waste of good herb. Instructions are given below for a simple, concentrated tea that can be stored in your refrigerator for up to 3 weeks – although it’s likely you will be drinking it faster than that! Pau d’Arco has a very weak bitter/bland taste, easily overpowered by other flavors, making it an excellent base for any other beverage you enjoy. It is a powerful anti-microbial effective against a myriad of fungi, bacteria, viruses and parasites. Lemongrass tastes, to my tongue, just like the Lipton Lemon Iced Tea mix my Mom made for the family when I was a kid, but much less sweet. It lends its flavor to this tea, masking the pau d’arco and providing a refreshing lemony tang. Lemongrass has anti-fungal, anti-parasitic and anti-bacterial properties. It is commonly used in Thai cooking and has GRAS (Generally Recognized As Safe) rating from the FDA in the United States. Please note: While both of these herbs in appropriate doses are very safe, I would not recommend them (or cleansing in general for that matter) to pregnant women. Instructions for the ‘Anti-Candida potion‘ appear below. Consume 1/2 cup – 1 cup of this simple tea throughout the day for the first 3 months of your Candida cleanse. This recipe makes 2 liters, which stores easily in a juice jug in the refrigerator; 2 liters provides 8-16 daily doses, so you only have to make it 2 or 3 times per month. You can add 1/2 – 1 cup daily to other liquids such as soup, coffee, or tea. Can be consumed straight as an iced tea or reheated. I usually just put mine in my water bottle and enjoy it as a weak tea all day. Put herbs in the pot and pour water over them. Cover and bring to a boil; reduce heat and simmer for 20 minutes. Allow to cool; strain and store, covered, in the refrigerator. While this tea is clearing the terrain in your colon, be sure to repopulate with healthy bacteria (sometimes called ‘probiotics’). These little guys are essential to your digestion and immune system; they are found in traditionally fermented foods such as real sour kraut, kefir, true yogurt, and kim chi. More on fermented foods and the friendly bacteria later! Western Materia Medica Course Manual by Terry WIllard Cl.H., PhD, Wild Rose College, 2011. Scientific basis for the therapeutic use of Cymbopogon citratus, stapf (Lemon grass) Gagan Shah, Richa Shri,1 Vivek Panchal,2 Narender Sharma,3 Bharpur Singh, and A. S. Mann, J Adv Pharm Technol Res. 2011 Jan-Mar; 2(1): 3–8. Wow, this seems promising, might need to give this a try. Love your post. The lemon grass tea really helped the flavor. 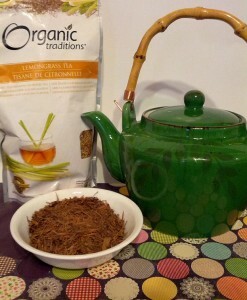 I usually drink lemon grass tea daily to help prevent the flu or colds. This is my first time trying pau d’arco dry bark and the lemon grass gave it a much better taste! Thank you for posting this! I’m glad you liked it. Cheers! Do you only drink 1c a day of Pau for Candidas? The box instructions say 3-4. Great question! This particular recipe is equal to 10-15 teabags of store bought pau d’arco. So yes, 1 cup is plenty!